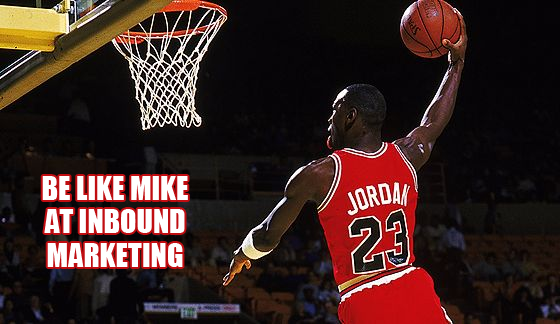 Michael Jordan would be proud: Here are “23” new articles to keep your iPad full and your mind on marketing 24/7 (hey, it’s only fair – that’s what we do). If you read all of these, please feel free to do a celebratory dunk before leaving a comment to let us know what you think. Quick is good. Less is good. Time-saving is good. Make design smarter, not harder. For when you feel like you’ve reached a design dead end, here is some inspiration to recharge your momentum. Codecademy is a platform that teaches people technical skills. They also have an awesome landing page that gets people interacting immediately. Here’s why blogger Katherine Leonard thinks that their landing page design rocks: minimal layout, instant coaching, and a template that inspires users to jump right in and get started. Your landing page probably doesn’t deserve a spot in a museum, but it is still a work of art that balances form with function. If you’re launching a new product, make sure that you have a beautiful landing page to support it and keep your visitors interested. Here are some elegant design trends worth studying. Spoiler alert: this read will literally take you 30 seconds. That’s the best part. Your landing page gets traffic, but people aren’t converting. What’s wrong? Reading this post might help you figure it out. 9. What Landing Page Optimization Tactics Have Worked for You? This LinkedIn discussion features seven stellar answers. Feel free to contribute your own. This infographic is a reminder of a game that we all know and love (hint: it’s Monopoly). Traditional web design will teach you to always put CTAs above the fold, but what if that principle is a total myth? Can a bottom-page CTA actually convert…better? A marketer is only as good as her landing page. If your traffic isn’t converting, here are the 5 most common reasons why. The key to creating the perfect landing page? That one’s obvious: be obvious. Mobile is a tough code to crack, but once you’re ready to go, your strategy is only as good as your landing page. Here’s what you need to take your customer engagement to the small screen. Wondering whether a mobile strategy is necessary for your brand? According to Erik Bortzfield at Ion Interactive, the rise of tablets and e-readers make mobile landing page design an absolute must. In a nutshell, you need to focus on leveraging user friendly technology. Focus on speed, avoid flash, and make sure that people can scroll through information with ease. Have you optimized your website for mobile yet? Here’s how to give your visitors a great user experience. We talk about UX so much that we sometimes forget about our text. Keep it short, make your calls to action prominent, and make your brand known. If you’ve ever thought about putting video on your landing page, now is definitely the time to try. I hate using that word, but these ones are a bit of a mix and didn’t really need their own sections. Sure, you’re getting conversions, but you could be doing better. Here’s how to write copy that really hooks people and reels them in. 21. What Are the Best Viral Landing Pages? This Quora discussion covers the psychology behind some of the most talked about landing pages on the web. Have questions? Well you’re in luck because Tim Ash has answers. Read what he has to say about top mistakes, copy length, and how to emphasize your CTAs the right way. Pete Kennedy’s advice? “Dumb it down.” Dumb advice or awesome advice? So now you’re prepped to improve your landing pages – and get ready for some exciting template updates coming from the Unbounce crew soon that’ll make it even easier.